Whether you’ve never made the trip before or you’re due for a return visit, this is the perfect time to go. Budapest beckons with gluten-free versions of traditional Hungarian dishes like lángos and sweet cheese pastries as well as mouthwatering takes on classics like croissants and pizza. The moment you set foot in Budapest, you won’t be able to help but admire two of its most iconic structures: the stunning Hungarian Parliament building, which overlooks the sparkling Danube River, and St. Stephen’s Basilica, which holds court a few blocks south. I recommend starting your visit with a stroll around the exterior of the ornate Gothic Revival Parliament building and a tour of the interior, where you can see jaw-dropping artifacts like the Byzantine Hungarian crown jewels. Then make your way to St. Stephen’s Basilica, which boasts incredible 360-degree views from its dome. You’ll have to climb more than 350 stairs to reach the observation deck, but the panorama is worth the trek—plus, pastries await a short walk away. Tucked away in Budapest’s vibrant Jewish Quarter, Free-a Glútenmentes Pékség (Free – Gluten-Free Bakery) is an essential stop, even if you’re only in town for a brief time. Co-owners Drs. Katalin Papócsi-Réthy and Péter Papócsi, who are both trained nutritionists, opened this dedicated gluten-free spot after their 2-year-old daughter was diagnosed with celiac. As the first artisan gluten-free bakery in Budapest, Free is beloved among both visitors and locals, who flock to indulge in the breads, sweet and savory croissants, cinnamon rolls and much more. Although I enjoyed my fair share of cheese croissants and chocolate rolls at Free, the pizza stands out as my favorite. 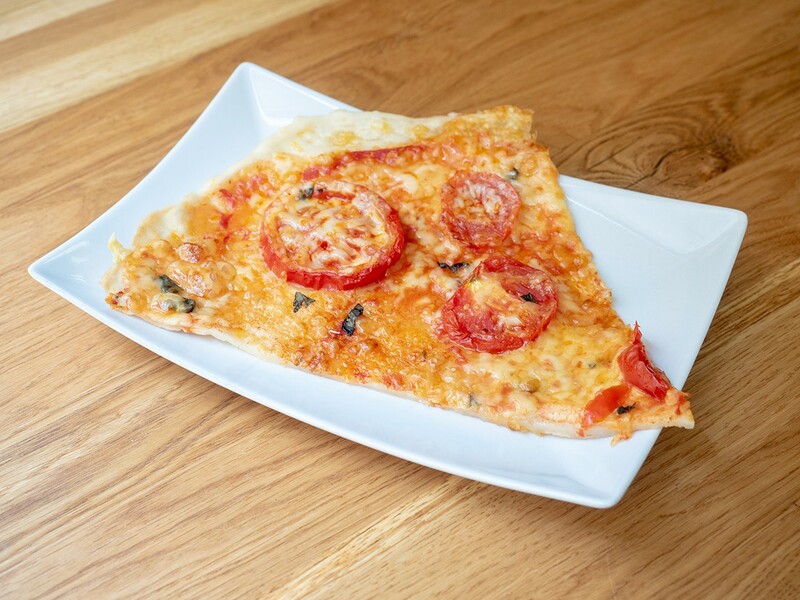 When you visit, time your arrival for shortly before noon, when several varieties of gluten-free pizza emerge from the oven, ready to be devoured by the slice. The delish varieties range from tomato and basil to ham and sour cream. Eat it right away, and take a couple pastries to savor later. Next, it’s time for a history lesson. As Hungary’s capital city, Budapest is home to plenty of fascinating museums and historic sites, but I found the Hungarian National Museum most interesting. If you aren’t familiar with Hungary’s history, from its founding in the late 9th century and its role in the Ottoman Empire to its experience in the communist era, you’ll want to spend several hours here. When you’re ready for a breather, treat yourself to a walk through Budapest’s Great Market Hall, which is just a few blocks from the museum. Still as bustling today as it was when it opened nearly 125 years ago, the beautiful structure houses more than 100 vendors selling everything from fresh and dried paprika to fruits and vegetables to meats and cheeses. You probably won’t spot any gluten-free baked goods at the Great Market Hall, but right down the street, you’ll find Manioka (Manioc), one of Budapest’s best gluten- and lactose-free bakeries. Owner Maria Bartha was inspired to open the bakery about two and a half years ago to share the gluten-free goodies she made for her own health and well-being. At the time, the baker found very few high-quality gluten-free products in Budapest. Today, she appreciates that the increasing competition from the growing number of gluten-free bakeries keeps her on her toes and encourages her to innovate. When you visit, I recommend trying her latest creation and sampling at least one of the classics, like the cheese croissants or the túrós táska (sweet cheese pastries). Arrive early for the best selection, and you might be lucky enough to snag one of her indulgent cherry sweet cheese pastries. Manioka is just steps from the Széchenyi Chain Bridge, a major landmark and popular avenue for crossing the Danube on foot. Before leaving this side of the city, however, you’ll want to squeeze in one more gluten-free snack. Hidden away on a residential street in District IX, the aptly named Fun Café is the brainchild of owner Hanna Németh. She eats gluten free by necessity and noticed a distinct lack of healthy, fun-to-eat fast-food options in the city. While she makes savory items like burritos and quesadillas as well as sweet treats like crêpes and waffles, the one menu item you have to try here is the lángos. 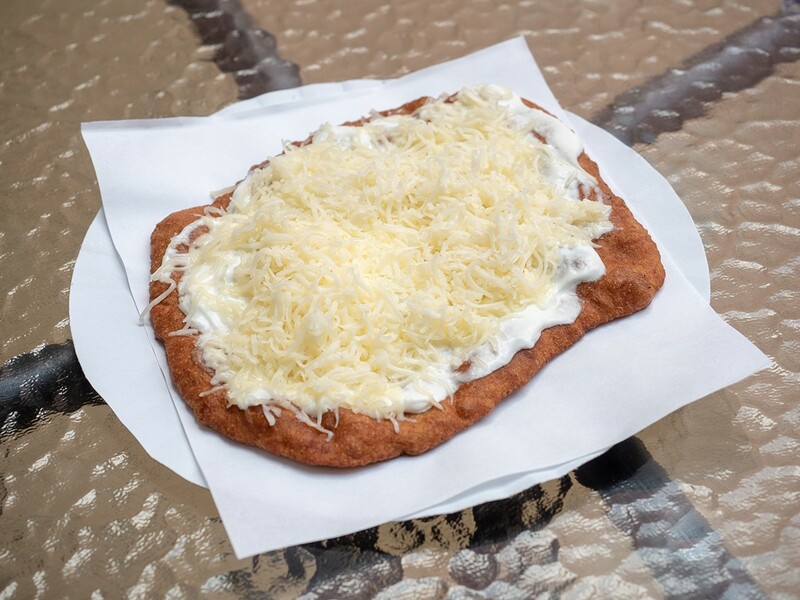 A bit like a deep-fried, extra-cheesy pizza, this quintessential Hungarian fast-food dish consists of a flattened disc of fried dough with a combination of toppings. Lángos usually comes topped with cold sour cream and non-melted shredded cheese, but Fun Café offers a tasty array of additional toppings, including bacon and arugula. To work off that lángos, walk across the historic Chain Bridge and enjoy a leisurely hike to the top of Gellért Hill. As one of the highest points in the city, this hilltop is the ideal place to gaze out over the Danube, the Parliament building and the Pest (pronounced pesht) side of the city, which falls on the east side of the Danube. Gellért Hill is also a short walk from Castle Hill, where you’ll find the top attractions on the Buda side—the west side of the Danube. A major component of Budapest’s UNESCO World Heritage site, the Buda Castle Quarter is the perfect place to absorb several centuries of history. Take in the views as you leisurely stroll through the storied Castle Hill grounds, which include the preserved Buda Castle, the Hungarian National Gallery, and often-photographed spots like Fisherman’s Bastion and Matthias Church. After seeing the highlights of Buda, you’ll want to enjoy a hearty meal at a jovial spot like Dobrumba, a local favorite. 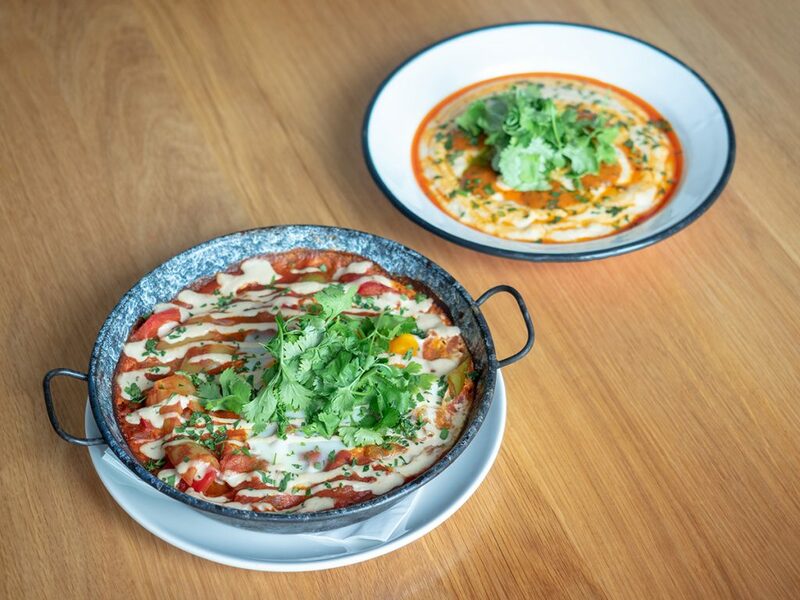 This unique spot specializes in Mediterranean cuisine that spans from the Atlas Mountains in Morocco to Mount Ararat in Turkey, meaning the menu features everything from Tunisian shakshuka to Israeli hummus to Greek moussaka. Although the restaurant isn’t completely gluten free, Dobrumba’s friendly staff is more than happy to walk you through safe, delicious options. The richly spiced shakshuka topped with fresh herbs and the hummus masabacha with veggies for dipping are just a couple of my favorites here. Many of Budapest’s biggest highlights dot the banks of the Danube, but there’s also plenty to see inland. Home to several historical and cultural highlights, City Park is a must-see. At the west entrance of the park, don’t miss Heroes’ Square, which houses a monument celebrating Hungary’s 1,000th birthday and massive bronze statues of the seven Magyar chieftains and other key national leaders. While you’re here, consider stopping by the iconic Széchenyi Baths, where you can soak in thermal waters rumored to have healing properties. Or just stretch out on the grass and enjoy a picnic featuring sweets from the nearby a40 Desszertszalon (a40 Dessert Salon). Located a few blocks southwest of City Park, this tiny sweet shop is easy to miss but a treat to discover. Owner Beatrix Kis decided to specialize in good-for-you desserts after finding that a low-sugar, gluten-free diet helped her live the active lifestyle she loves. In addition to being gluten free and low in sugar, many of the sweets are also dairy free or egg free, making this the place to go for complex food allergies. Although a40’s berry-topped cheesecake is beyond decadent, you can’t visit this dessert shop without sampling the Isler cookies. 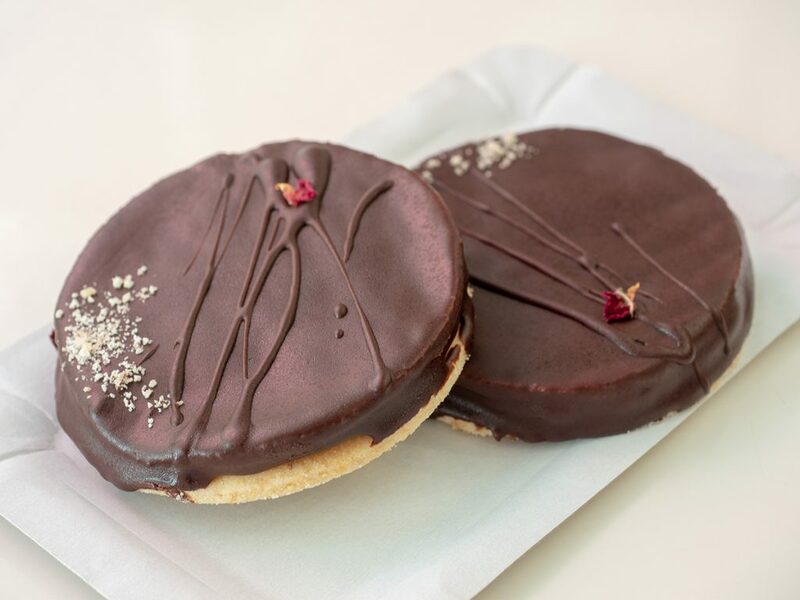 Featuring jam sandwiched between two delicate shortbread-style cookies and dipped in chocolate, this gluten-free version of a Hungarian classic is the perfect indulgence. For an even bigger stretch of green space and more picnicking opportunities, Margaret Island is your destination. Located smack in the center of the Danube, this island is a wonderful place to escape from the city with its many miles of walking paths, beautiful gardens and lively outdoor bars. Since food options are limited on Margaret Island, stop at Nyugati Cöli Bisztró (Celiac Bistro West) for picnic supplies before you head out. Designed for people with celiac, this busy bistro is completely gluten free and offers both daily lunch specials and regular menu items like pizza, burgers and sweets. You’ll be spoiled for choice here, as the bistro has 80 products in regular rotation and debuts new goodies regularly. Try the hazelnut crème pastry if you’re in the mood for something sweet, or munch on a slice of pizza if you prefer savory. The bistro even has a small market with local and international gluten-free brands, so you’ll find everything you need for an afternoon on the island here. Whether you’re making a quick stopover during a Danube River cruise or you’re planning a longer stay in the region, Budapest is well worth a visit. With so many scrumptious treats to discover, the Pearl of the Danube is a true gluten-free gem.